Don’t you hate it? Weeds in your lawn. Nothing looks worse. Luckily most can be controlled easily with chemicals. Of course, some people don’t want to use chemicals so we even have some tips for you. The best 2 ways to prevent weeds is to mow regularly and choose a lawn like Buffalo or Zoysia that competes well with weeds. But even doing that you still sometimes get nasty little invaders. Broad leaf weeds are easy to identify and easy to kill. 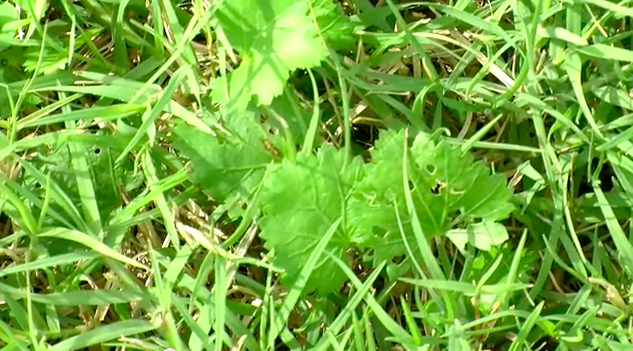 The have broad, generally flat leaves and can be sprayed out of your lawn with chemicals such as Bromoxynil mcpa often sold under the brand bindi eye killer. If you have buffalo turf make sure you use one compatible with buffalo. If you don’t like chemicals try pulling the weeds out or using steam or hot water on them. Doing the hot shoe shuffle over bindi eye is every kid’s nightmare. To kill these nasty broad leaf bindi eye weeds before they bother you keep an eye out for them in winter, before the prickles develop. It may be necessary to spray then 2 or 3 times as the seeds germinate at different times over winter. The only good bindi is a dead bindi. The key for controlling weeds in general is to stop the next generation by killing weeds before they seed. Grass weeds are the hardest to kill annual grass weeds grow really quickly but at least they die each year. Long lived grass weeds like paspalum are really hard to get rid of. The easiest way to remove them is to chip them before they seed but if you have too many, my favourite method is to use a wick wiper filled with round up. Simply wipe the herbicide on the weed and it will die. You may have to repeat this in a few weeks. Make sure you don’t get any on your lawn. Sometimes you get Kikuyu in your buffalo lawn. To kill it I lay down flat and paint round up on each leaf making sure I wear a glove to protect my skin. A good healthy regularly mown lawn particularly buffalo and Zoysia will generally out compete weeds.